The "Tour de Litchfield" was very enjoyable and enlightening. It doesn't seem possible that one town could have so many scenic back roads. Our new ride leader, George, did a great job putting all the roads together and marking the many turns so that none of us got lost. The route kept to Litchfield for the most part with a brief sojourn into West Gardiner. The start location in Litchfield Corners was historic: we set off from in front of Litchfield Academy, a venerable 19th Century school of widespread fame where students would go to "fit" for college (what we would call a prep school today). The building is now a senior citizens facility - they were open so we made use of their restrooms so we could "fit" for the ride. The weather once again was on our side. It started out overcast but dry, and eventually we were rewarded with sunny skies. Traffic was light, and we rolled by numerous working farms. We did see quite a few people out in their yards, and there were a couple of large outings in town - a kids' fishing derby and a school fair. We passed one fellow, known to George, who was working on a vintage Jaguar in his driveway - we did not see him driving it around, however. Some of the route traveled roads we had rode on the week before, but often in reverse, so we got a different perspective (as well as going downhill where we went up before, and ascending where we once went down). We stopped in Purgatory for the second "cookie stop" at the Luckhursts in two weeks. We felt lucky to be in Purgatory (although we were able to find our way out). It was a great ride and we will definitely have to go touring in Litchfield again. 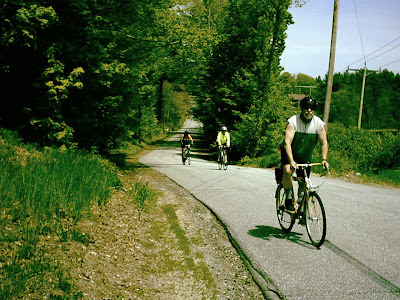 Next week's ride will be in Belgrade Lakes to kick off your Memorial Day weekend. Hope to see you there! 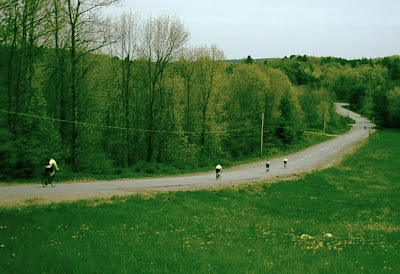 Great description of our ride- what an excellent "Tour de Litchfield" it was! Thanks for doing the Blog, it's fun to read.